One of the best parts of visiting Cape May is spending time at the beach. But, what are the things to do at the beach in Cape May? From building sandcastles to surfing to just putting your toes in the sand to relax, there are a variety of options to pursue. 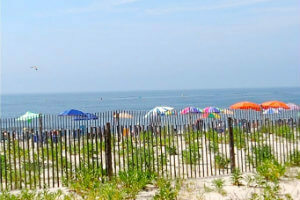 The most favorite place for kids is our pristine Cape May beach with a walking promenade of 1.6 miles long. Of course, the summer offers making sand castles, swimming in the warm ocean water, flying kites and more just to name a few fun things to do. But, even in the off season, kids and adults like to walk the beach and even sometimes put their feet in the water. Our beach is open all year long. During the summer beach tags are required to keep our beaches clean and pay for life guards to be on duty until 5:00 P.M. to keep our visitors safe. Children under the age of 12 are free. It’s a great, inexpensive way to enjoy Cape May! At Cape May Point just 3.4 miles away from downtown Cape May there is a State Park, which is free to the public and has ample free parking. For a small fee, you can climb the 199 steps of the 1859 Cape May Point Lighthouse for a great bird’s eye view of the surrounding areas. In the park, there is a great bird observation platform and three nature trails. There is also a small nature center with programs for children. You can also use the picnic tables for you to enjoy a nice lunch with the family or friends in a lovely setting. The beach is also a prime location to see dolphins in Cape May as they often migrate there during the day. These two beach options are a great way to enjoy the beach in Cape May. They are economical, frugal and simply stunning for their views. We hope that you can get a chance to explore the things to do at the beach here in Cape May. 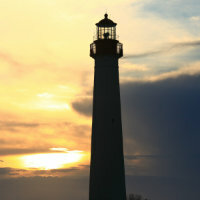 This entry was posted in Activities and tagged activities, beach, cape may, family, lighthouse by Deanna Brown. Bookmark the permalink.